In addition to costing more, the stealthy F-35 could take longer to complete testing. That could delay the stealthy jet's combat debut to sometime after 2018 - seven years later than originally planned. And all this comes as the Pentagon braces for big cuts to its budget while trying to save cherished but costly programs like the Joint Strike Fighter. Frank Kendall, the Pentagon's top weapons-buyer, convened the so-called "Quick Look Review" panel in October. Its report - 55 pages of dense technical jargon and intricate charts - was leaked this weekend. Kendall and company found a laundry list of flaws with the F-35, including a poorly-placed tail hook, lagging sensors, a buggy electrical system and structural cracks. Some of the problems - the electrical bugs, for instance - were becoming clear before the the Quick Look Review; others are brand-new. The panelists describe them all in detail and, for the first time, connect them to the program's underlying management problems. Most ominously, the report mentions - but does not describe - a "classified" deficiency. "Dollars to doughnuts it has something to do with stealth," aviation guru Bill Sweetman wrote. In other words, the F-35 might not be as invisible to radar as prime contractor Lockheed Martin said it would be. The JSF's problems are exacerbated by a production plan that Vice Adm. David Venlet, the government program manager, admitted two weeks ago represents "a miscalculation." Known as "concurrency," the plan allows Lockheed to mass-produce jets - potentially hundreds of them - while testing is still underway. It's a way of ensuring the military gets combat-ready jets as soon as possible, while also helping Lockheed to maximize its profits. That's the theory, at least. But that optimism proved unfounded. "This assessment shows that the F-35 program has discovered and is continuing to discover issues at a rate more typical of early design experience on previous aircraft development programs," the panelists explained. Testing uncovered problems the computers did not predict, resulting in 725 design changes while new jets were rolling off the factory floor in Ft. Worth, Texas. And every change takes time and costs money. To pay for the fixes, this year, the Pentagon cut its F-35 order from 42 to 30. Next year's order dropped from 35 to 30. "It's basically sucked the wind out of our lungs with the burden, the financial burden," Venlet said. Tasting blood in the water, Boeing - America's other fighter-plane manufacturer - dusted off plans for improved F-15s and F-18s to sell to the Pentagon, should the F-35 fail. Deep cuts to the defense budget certainly aren't helping the F-35′s case. But another "rebaselining," or restructuring, is likely in the wake of the Quick Look Review. F-35 testing and production should be less concurrent and more "event-based," the panelists advised. In other words, the program should worry less about meeting hard deadlines and more about getting the jet's design right. It'll be ready when it's ready. Major production must wait, even if that means older warplanes - the planes the F-35 is supposed to replace - must stay on the front line longer. Needless to say, that's got some members of Congress up in arms. 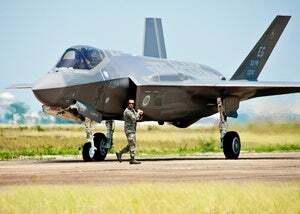 "It is at this exact moment that the excessive overlap between development and production that was originally structured into the JSF program … is now coming home to roost," said Sen. John McCain, an Arizona Republican and the ranking member of the Senate Armed Services Committee. "If things do not improve - quickly - taxpayers and the warfighter will insist that all options will be on the table. And they should be. We cannot continue on this path."